Bikepacking sacoche Vaude Trailsaddle noire, étanche, 12L. Bikepacking sacoche Ibera waterproof carryall noire, 6L. 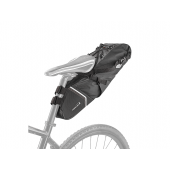 Bikepacking sacoche Ibera waterproof carryall grise, 10L.